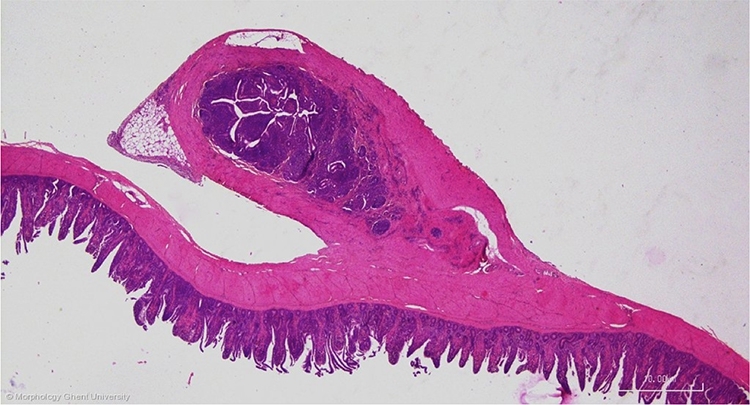 Meckelâ€™s diverticulum (diverticulum vittelinum) is the remant of the yolk sac that gets infiltrated with lymphoid tissue after the yolk has been absorbed. It thus has two functions: supplying nutrients first days after hatching and acting as a secondary lymphoid organ hereafter. In chickens, pigeons, ducks and geese, Meckelâ€™s diverticulum persists through life but in most birds it disappears early.